I have to admit to being nervous whenever I hear that a beer has been designed for a specific market or niche. Experience has taught me that the resulting drink often bears all the hallmarks of being created by a committee composed of the Marketing Department and the Finance Department resulting in, well, a less than spectacular beer. So it was some trepidation that I listened to Empress Ale’s founder Surj Virk explain that his beer had been designed to offer a more traditional ale alternative to the otherwise lagerful beer menus in Indian restaurants. Of course, a cold lager is akin to the ‘universal donor‘ of beer/food matching – light bodied, lightly flavoured and not as aggressively hopped as more ‘crafty’ offerings can be; there are very few cuisines that it doesn’t sit comfortably with. They may not be perfect matches that will have gourmands waxing lyrical, but it’s never going to clash unpleasantly. Ale on the other hand – be it Real or Craft – can be a bit more of a minefield. It requires significantly more thought from the restaurant and although beer sommeliers are a thing they are few and far between. 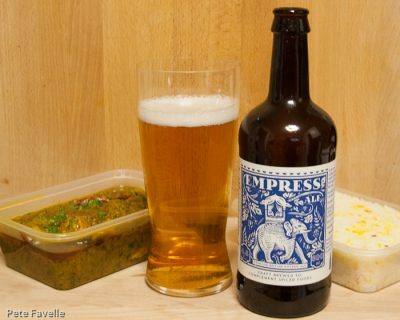 So a beer specifically engineered to match with a given cuisine has clear commercial appeal – the question is, is it up to the job? It’s a bright, golden ale with plenty of rising bubbles and a fine-textured head – a look that will be reassuringly lager-like to people more used to a Kingfisher with their curry. The aroma is gently malty with plenty of earthy and slightly spicy hops, along with a hint of coriander seed. It’s restrained though; this definitely isn’t a hop bomb. In the mouth, there’s a light and gently sweet fizziness that is quickly joined by a gentle but building, slightly spicy bitterness that leads into a pleasingly dry finish. On it’s own, it’s a pleasant enough pale, mildly hoppy beer but it blends perfectly with a plate of spicy food. The spices from both plate and pint re-enforce each other perfectly, the dry finish cleanses your palate nicely and the gentle fizz – never unpleasantly overdone – calms the chilli heat. This probably isn’t a beer I’d drink on its own but to be fair, it was always designed to be paired with Asian food. And in that environment, it does a remarkably good job – if your local Indian doesn’t have it on their menu, ask them why not! Many thanks to Empress Ale for providing samples of their beer for Pete Drinks to try!